A Daimler "CD650" SRB425 squeezes under the railway bridge on Repton Road in 1973 during the "Farewell to the Blue Bus" tour. Anyone who has moved to Willington within the last 25 years may be forgiven for having never heard of The Blue Bus Service. Those who lived in the Derby & Burton area in the 1980�s may remember the name being used on the City Transport coaches, but not know the connection with Willington. However, The Blue Bus was integral to daily life in Willington for much of the middle part of the 20th Century. During the pioneering days of rural motor omnibus services in the 1920�s a fledgling service began between Burton and Derby. The route passed through Newton Solney, Repton, Willington and Findern and saw fierce competition with the already established Trent Motor Traction service. The vehicles in use then appear somewhat primitive to the modern eye. Reputedly, on at least one occasion, the combination of poor weather and the climb up the valley side between Burton & Newton Solney required the passengers to get out and push. The regular driver, a chap named Jack Dean was apparently quite a character - beginning a tradition of friendliness with which the Blue Bus was to remain synonymous. Daimler 702PRA turns out of the Repton road garage. This early start gradually grew, via a series of partnerships; Jack Dean and Arthur Allen then Jack Dean and Percy Jowett Tailby followed by Jack Dean, Percy Tailby & Harold George and finally, in 1927, Tailby & George. 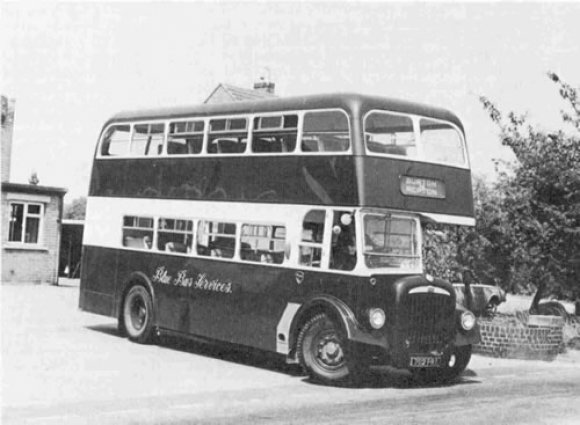 The service these men provided had become known as The Blue Bus Service and in about 1930, the company moved their operation to premises on Repton Road at Willington. The company had expanded their operation to include a second route between Derby and Burton, this time via Etwall, Egginton and Stretton. On 9th October 1939, the company became Tailby & George Ltd. and entered a period of steady, reliable and, above all, committed service, continuing under the branding of Blue Bus Services. Passenger numbers were such that during the Second World War, the company began operating double-deck vehicles requiring special low height vehicles due to the 136 headroom of the railway bridge in Willington. 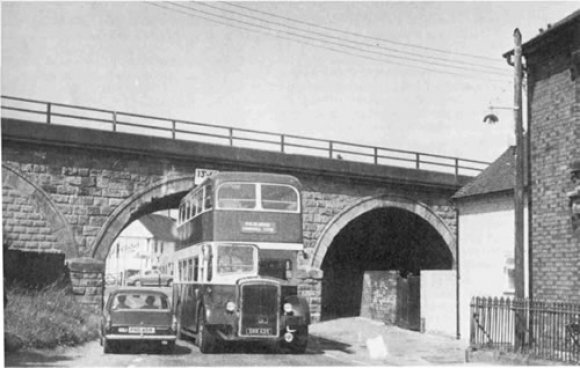 Despite the odd scrape (and one quite heavy thump on the Twyford Road railway bridge in 1968) the double-deckers were very successful. The seriousness with which the Blue Bus company regarded its duty to its passengers was not lost on the local population and the company was a much loved part of Willington village life. Staff were urged to bear in mind they were providing a service and without the customers there would be no job. Politeness was the watch-word with passengers each receiving an individual thank you as they alighted. The company outgrew the original garage which was on the east side of Repton Road and new premises were built on the opposite side of the road, opening in June 1956. The low stone wall on either side of the entrance to this garage can still be seen just on the village side of Saxon Grove. Throughout much of their history, the company were loyal to Daimler as suppliers of vehicles, which was rewarded by Tailby & George being heavily involved in the trial of a prototype vehicle during the 1960's and receiving two of the first vehicles off the resultant production line. Since the untimely deaths of their spouses in 1955 & 1957 respectively, the company had been run by Mr Tailby & Mrs. George. Percy Jowett Tailby died in 1957 leaving Bunty Marshall and Katherine George as partners until Katherine's death in 1965. The remaining shares in Tailby & George Ltd. were then acquired by Douglas & Bunty Marshall, the latter being the daughter of the Tailbys. By the 1970's public transport was in a state of serious decline. The railways had been decimated by Beeching and the majority of the bus industry was either nationalised (i.e. Trent) or in the hands of the local council, as in Derby and Burton. Small independent companies like Tailby & George faced fierce competition from the bigger companies. On 1st December 1973, the then proprietors of the company, Mr. & Mrs Marshall made the decision to retire. After much speculation the operation of the Blue Bus Service passed from Tailby & George Ltd to the Derby Corporation. The transaction cost Derby Corporation £212,039, for which they gained a fleet of 23 vehicles and a tremendous amount of Goodwill. The passing was mourned by locals and bus enthusiasts alike. Careful and skilled maintenance of the fleet had meant that as well as a steady programme of new vehicles, older examples were still available for duty, leading to a certain nostalgic charm whilst maintaining a more than functional day-to-day service. Transition to Derby Corporation (Derby Borough Transport from 1974) was slow but steady. A gradual integration of the fleet, livery and, notably, working practices took place such that by early 1976 the future of Willington as a bus depot was questionable. At best the garage was likely to retain the ever growing private hire business with the Burton & Derby service buses moving completely to Derby. Thus the writing was already on the wall for Blue Bus Services to become Derby Borough Transport's private hire brand when fate leant a helping hand. The last vehicle into the garage had been parked up and the garage locked at 23:05hrs on the night of Monday, 5th January 1976. For many it had been the first day back at work after the long new year holiday and, as was normal practice, the entire fleet had been fuelled on returning to the garage ready for the next days work. In all 19 buses and a van were in the garage when, at 23:25hrs smoke was reported issuing from the building. 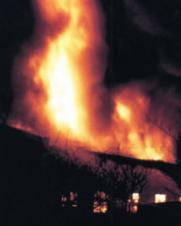 By the time the fire service arrived the entire garage area was engulfed and the fleet was wiped out. The premises were destroyed along with a number of unique and historic vehicles as well as the spirit of Blue Bus Services. Derby Borough Transport hastily acquired replacement coaches to maintain its services and private hire commitments but all operations were now centred on Ascot Drive garage in Derby. Two former Blue Buses which were at Ascot Drive awaiting disposal were reinstated after the fire, but were subsequently scrapped when the unexpected need for them was ended by replacement vehicles. The Blue Bus garage was pulled down and the site lay empty for a number of years. In the 1990's Saxon Grove and the appropriately named Tailby Drive were built on the site. Even the name Blue Bus Services has vanished from commercial use. Derby Borough Transport became Derby City Transport and subsequently privatised. Quaint names with local historical significance don't fit into the corporate world of 21st Century transport. 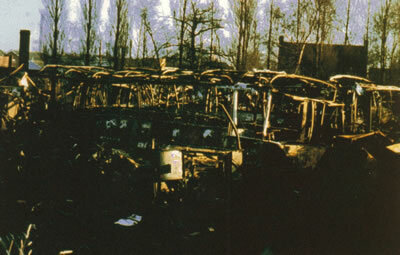 A number of vehicles from the Blue Bus fleet did survive, having been preserved before the 1976 fire. Now that their connection with Willington has been severed, who knows if they'll ever visit the village again? In writing this page, extensive use has been made of Blue Bus Services by David Stanier, published in 1984 (second edition) by J.M.Pearson & Sons (Publishers) Ltd - ISBN 0 907864 19. Although long out of print, copies periodically appear in second hand book shops and local libraries should hold a copy. In the hope that this short article has whetted your interest, I strongly urge seeking a copy out. Mr. Stanier's assistance in checking through my text and correcting errors is greatly appreciated. The photographs are from his book and are used with his permission which is greatly appreciated. Since the 'publication' of this text on this Web Site, Mrs. Bunty Marshall, who still lives in the area, has been kind enough to assist me with additional information. I am greatly indebted to her for that and for allowing me to view her wonderful album of Blue Bus photographs. Beyond the scope of this article, but mention ought to be made in passing that her late husband, Mr. Douglas Marshall was a Spitfire pilot in World War II - and the tales of his wartime exploits are as fascinating as one would expect. Thank you Mrs. Marshall.